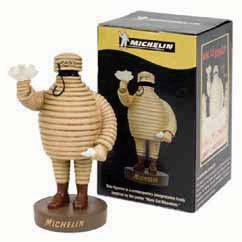 Paying homage to Michelin's founder and heritage, this nostalgic polyresin Michelin Man is a great modern-day reminder of our inspiration and values. After being inspired by a sketch, Andre' Michelin created a man made from a pile of tires with a cup of nails and broken glass and reshaped the slogan "Cheers, the Michelin tire drinks up obstacles!" Gift box included Approximately 6 ½" tall. 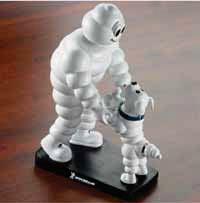 This fun, ever-popular collectible captures the spirit of the Michelin Man and highlights his fondness for his four-legged friend. The hefty polyresin design tops off any desktop or bookcase with a light hearted touch. Measures 8" tall. Everyday essential cap in 100% navy cotton twill. 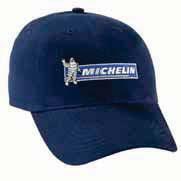 Features 6-panel construction, mid-proﬁle design, Velcro ® closure, stitched eyelets, and a fashion-curved bill. Embroidered logo on front. s Best wet performance versus the leading competitive sport touring tires for small displacement bikes. s Pilot ® Road 2-inspired tread design delivers proven performance with the aggressive styling that sportbike riders want.